Texas Rangers 2011 World Series Framed and Matted Panoramic Photograph. This officially licensed MLB panorama photo is of Rangers Ballpark in Arlington, Texas, during the Opening Ceremony of the 2011 World Series (Game 3) on October 22, 2011. The Texas Rangers played the St. Louis Cardinals. The deluxe panorama features black or blue double matting and your choice of black or cherry frame, with a 1" x 4" engraved brass nameplate. Actual size is 40" x 14"
Texas Rangers 2010 World Series Game 3 Framed and Matted Panoramic Photograph. This officially licensed MLB panorama photo is of Rangers Ballpark in Arlington, Texas, Game 3 (Top of the Fifth) of the 2010 World Series on October 30, 2010. 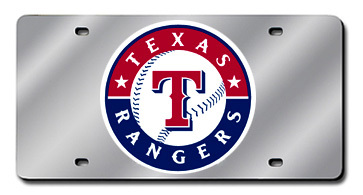 The Texas Rangers defeated the San Francisco Giants 4-2. The deluxe panorama features black or blue double matting and your choice of black or cherry frame, with a 1" x 4" engraved brass nameplate. Actual size is 40" x 14"
Texas Rangers 2010 World Series Game 3 Framed Panoramic Photograph. This officially licensed MLB panorama photo is of Rangers Ballpark in Arlington, Texas, Game 3 (Top of the Fifth) of the 2010 World Series on October 30, 2010. The Texas Rangers defeated the San Francisco Giants 4-2. The Texas Rangers played the Anaheim Angels. The standard panorama features your choice of black or cherry wood frame. Actual size is 40" x 14"
Texas Rangers / The Ballpark Opening Day Framed and Matted Panoramic Photograph. This officially licensed MLB panorama photo is of The Ballpark at Arlington, the home of the Texas Rangers, (Opening Day) on April 5, 2002. The Texas Rangers played the Anaheim Angels. The deluxe panorama features black or blue double matting and your choice of black or cherry frame, with a 1" x 4" engraved brass nameplate. Actual size is 40" x 14"
Texas Rangers / The Ballpark Opening Day Framed Panoramic Photograph. This officially licensed MLB panorama photo is of The Ballpark at Arlington, the home of the Texas Rangers, (Opening Day) on April 5, 2002. The Texas Rangers played the Anaheim Angels. The standard panorama features your choice of black or cherry wood frame. Actual size is 40" x 14"